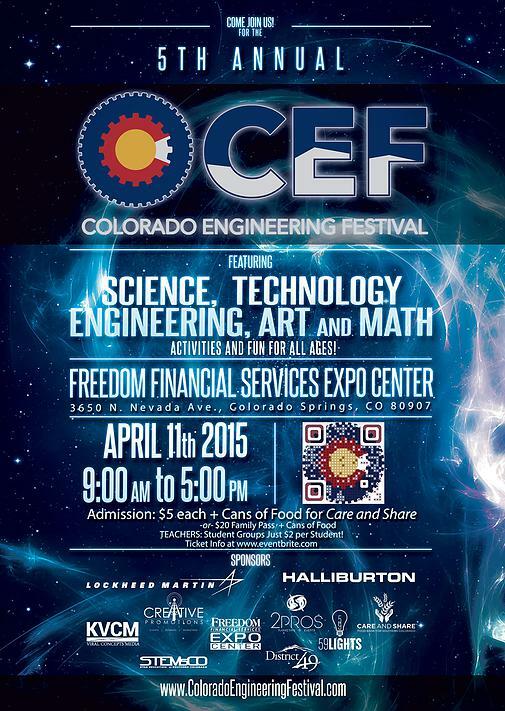 April 9, 2015 – The 5th Annual Colorado Engineering Festival (CEF) will be held at Freedom Financial Expo Center in Colorado Springs on April 11. The festival is a public/community event for anyone interested in learning more about the various careers in S.T.E.A.M. (Science, Technology, Engineering, Art and Math) related fields and includes fun activities for all ages. CEF gives students and parents an opportunity to have conversations with real engineers and to connect with major universities offering top-notch engineering programs. It’s also an opportunity to learn how to best prepare to pursue an engineering degree. Many of the major engineering schools from Colorado are involved, including the Colorado School of Mines, University of Colorado at Colorado Springs, Colorado State University-Pueblo, Pikes Peak Community College and more! The summit includes breakout sessions and keynote speakers on topics such as emerging technologies, women in engineering, and what people hiring engineers look for. Additionally, there will be plenty of hands-on activities. Previous years have included sensory games, virtual robotics, car racing, paper airplanes, Lego building, and more. Admission will be $5/each or $20 for a family pass, plus cans of food. Teachers can bring student groups for only $2/student.